Last week, Mike G. reminded us that we don’t do a lot of hacking at our weekly Hackfest, which is something I also wasn’t happy about. We did some brainstorming and decided to try writing a Facebook app. So, last night, Glenn Martin and I sat down and started working on it. We started out trying to use Glenn’s hosting provider, but it choked on Facebook’s POST requests with a HTTP 405 error, not liking the HTTP verb. After a few minutes of fiddling around in the web-based control panel and having no luck, we decided to punt and use my Dreamhost setup. It’s nothing special yet, but it’s a start and is finally something we can actually start hacking on at the Hackfest. Next week, I hope we can all get the basics of our app. functionality working. Between now and then, I’ll try to elaborate more on the concept behind the application so people will understand what it’s supposed to do. 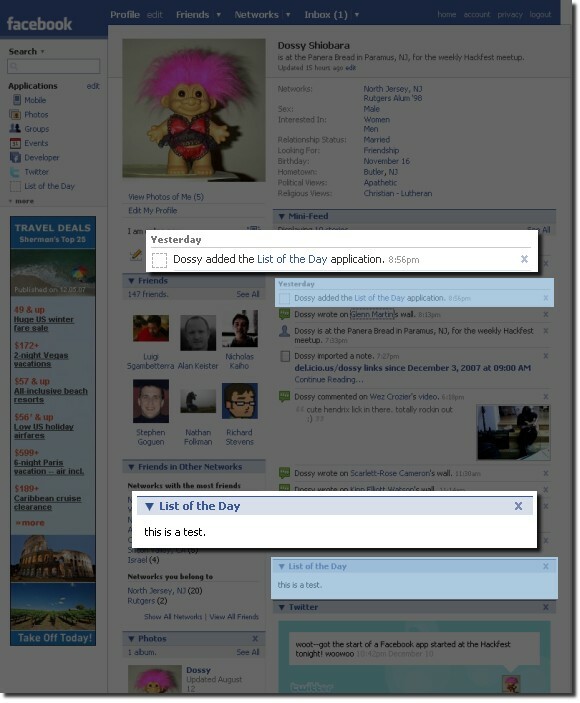 Hey Dosy, Rik here, still chasing down what functionality you intend to have your nifty FB App to perform. Rik: Yeah, I need to put some notes down on what the app. is supposed to actually do. Maybe tonight.